The Rebellion is doomed; it is only a question of time and firepower. 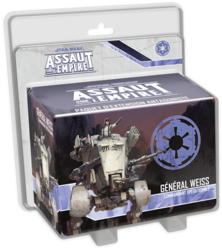 The tactical genius of General Weiss, Operational Commander, upsets your Assault on the Empire! The "Plan of the General" Project card series provides the Imperial player with unparalleled tactical options and a thrilling side mission that will fit into any campaign. This expansion also contains formidable Command cards, as well as two unique skirmish missions to play one on one.